Hey, I brush and eat milkbones! Why would you brush a milkbone? cause its hair is messy, duh. Because Sleet is much to dignified to eat a milkbone that is not both tasty and aesthetically pleasing. Hey, I've eaten Milkbone for real and I can honestly say it doesn't improve one's breath whatsoever! Brushing one, well y'know, never thought about it, but I suppose it might put just the right aroma onto the brush for a good ol' fashioned hint of freshness & make toothpaste just that much more palatable. Hey! A fox needs to keep good hygiene. People will think I'm a dog! They also don't taste all that great. "Oh wow, you're one of those furries?" "Huh? I just like drawing cartoon animals. I blame it on all those Disney movies I watched as a kid." "Dude, I just like to draw cartoon-y stuff. That's all there is to it, regardless of whatever this 'furry' thing you're talking about is." Mayday Mayday Mayday, I am at risk. I don't know if I have already said it, but my best friend kinda knows that I might be furry and sure of my interest in cats and he has seen my furry drawing and he even said he might be getting me a cat (furry) paw and a scratch post for this Christmas present so that I can act like a cat... and I think he is trying to figure out if I am furry or not. he has mentioned of furry more than 20 times this week. ummmm ahhhh. how should I react? I can't just say "I just like to draw cartoony animals from diseny" here, he is also computer/internet geek like me and he already knows lot about furry along side with other internet stuffs. he wouldn't be all stereo typical but I'm little uncomfortable with other friends of mine may hear of it and be stereotypical about it. It's not a big deal. Don't treat it like one if you don't want others to. We're not going to change our advice. Yeah it's really no big deal at all. Act like that and he probably will too. You really shouldn't worry about it. Worrying ab out it just makes him more likely to call attention to it. I know people where i'm at don't realy care what a furry is, and i'm sure most people don't, but when people try calling attention to the fact that you're a furry, it's usually negatively and it really puts him in the spotlight more than you. From the sounds of it though, it sounds like he's just teasing though, so like the others said, don't let it get to you. Just keep cool and say something like "Yeah I am, so what? No big deal. I like animals and cartoons n'stuff." If you don't want him going telling others about it, let him know that. I'm expecting to be in a similar boat soon TC, my friends know I read furry comics and I'm going to start learning to draw soon. I think if it came up again my friends would eventually label me as a furry. Frankly, I'm wanting to push the issue so it's no longer an issue. Now, my friends are the type who will take something different about you and make jokes about it but never really condemn you for it and your friend might be better or worse in terms of their understanding but for general advice, I'd say either let him think it and treat it like nothing or say something to him like "Hey, I like drawing furry characters, it's no big deal and no different than you liking [insert one of their favourite things to do here]. However, I'd prefer you not to label me a furry in front of others because they may take it the wrong way." There's nothing wrong with being a furry and as cliche as it sounds, if your friends are going to treat you differently, even after you tell them it's not as bad as they think, then they aren't really your friends. Don't worry, we'll always be here for you! I agree with GunRacer's advice, and texascat, if your friend is really bothering you that much about it, it sounds like he's either being a jerk or he's just your best friend so he's teasing you because he knows you well enough. I get labeled as furry often, but I don't identify with the title. *shrugs* I wear an orange fox hat with ears just about everywhere and I used to have a furry drawing on one of my binders. Most people aren't internet enough to know that it's part of the furry culture, so they just call me a hipster and go about their day. thanks for helping me y'all. he is really good best friend of mine, we laugh until we throw our guts out. and him me and other friends had semi-christmas party yesterday. so it's not that he is a jerk. I think we are playing some kind of game. i totally understand. who doesn't like animal hat? and hey, what's wrong with hipsters? first off he himself was a brony once. so, huummmmm *inserts* well I hope that vends a good thing out of it. and your friends are just like mine, my friends and I once teased him as a "censored (Diss, it's safe)" and that was only for few days. even if other friends know of it, they will just bring it once or twice in a month as a joke, not a big deal. I should just make no big deal about it but I want to push the issue so that I don't have to hide it/play a game. You really shouldn't worry about it. Worrying about it just makes him more likely to call attention to it. I know people where i'm at don't realy care what a furry is, and i'm sure most people don't, but when people try calling attention to the fact that you're a furry, it's usually negatively and it really puts him in the spotlight more than you. From the sounds of it though, it sounds like he's just teasing though, so like the others said, don't let it get to you. I surely did sound panicked yesterday. I'll just be calm and deal with it intelligently, while making it no Big deal. I like how we get into this little mini-discussion about milkbones. My dog had a milkbone and she ended up getting sick from it. I really want to try a dog treat for furry cred but I'm too much of a wuss with food. I've eaten Milkbones before, like, a lot of them. I find most of the pet treats are rather mealy - sort of like trying to eat field corn versus sweet corn on the cob. The best pet treats I've found are the jerky flavored treats. Those aren't too bad. Crunchy cat food is *okay* for the most part and generally much more palatable than the dog foods. It's also generally more expensive. I think it's probably because cats are picky eaters so the pet food companies have to make it taste better than the stuff they make for dogs, who generally will eat anything. Now that said, I don't generally sample pet foods, except when I first buy it for my pets. I've tried all of their snacks. The kitty treats that they love, I *hate*, Its like eating fish-flavored playdough clay ! X.X ick! All I know is that nine years ago, my kids accidentally filled his food dish with a cup of my choice Kenya AA and didn't notice until I came home from work. I found poor kitten staring at his food dish and sitting there... >munch< >crunch<... "must be food, or they wouldn't have put it in there...." but he was obviously hungry and hadn't eaten much of the Kenya AA, if any. Oh, and back to the subject at hand. 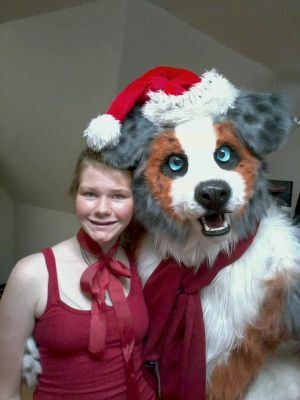 There are fans of furry stuff, like fursuits, anthropomorphic movies, comics, and fiction, and then there are fashion furries who like the style of dress, and then there are therian furries who like to dwell within animalistic mindsets, and then there are still other niches and sub-categories. Personally, my interests are a select few (about eight or nine) webcomics I like, a bunch of movies (mostly Disney, studio Ghibli, & the like), and of course, the fun of fursuiting in public places that I get the privilige to enjoy. So am I a furry? Not in the classic lifestyle sense. There's people who now greet me at my church with a "Hi, Doggy!". However I'm also known for shooting sports,motorcycling, guitar playing, gospel trio singing, father of three terrific young people, auto racing, car building, amateur radio, USAF veteran, and being a PhD grad student in geophysics. So, am I a furry, a Christian gospel singer, a vet, a car guy, a geologist? Am I a computer nerd? Engineer? Ham radio operator? None, or all of the above?? Far as I know, it's the caffeine involved that does the damage. If kitty survived the initial beaning without major issues, I don't know that a single daily bean is going to pose any more risk of problems than age, diet and lifestyle habits normally do. That said, I'd wonder if half a bean would work - still maintains the ritual, reduces the intake in half. And yea, I don't know what the difference between being INTO furry and BEING a furry is, but I'd like for the default concept of it to be as an interest to enjoy, and not thought of as a perversion to hide. Watching the brony phenomenon and how it is perceived by society is sorta relevant. In 5 years will people think of bronies as just some guys that like the show, or something representing the less kid friendly aspects of the fandom? I just looked it up and according to Cornell University, the caffiene toxicity for cats is between 100 and 300 mg/kg of body mass. My cat, being 8 kg, maximum toxicity is therefore 800 mg - 2400 mg. A coffee bean is estimated at having between 1 and 14 mg of caffiene per bean. Therefore it'd take a dozen beans or so to hit 100 mg, which is well under the toxicity threshold for most cats. So, I think Nikki's bean habit is probably safe. I really don't see a difference between being a furry and being "into" furry. I have never considered myself a furry, but I can appreciate anthropomorphics. I do like stories with non-human characters and I do like animals. I have some friends that are furries. Some of them are minor celebrities in this fandom. One is an artist, fur suit builder, and bagpipe player called Scape. He's nice guy. Commission some art from him. Other than the furry thing, he is also a BMX trick rider. Just a jack of all trades. I guess if someone is willing to "dabble in it" so to speak by, for example reading a few web comics, but don't feel that they identify themselves as one they could be "into it" without being a furry. Isn't Copper a pretty good example to the contrary? He's not really "into" furry, he just hangs out around us a lot. I'd probably be a candidate for "into" furry but not a furry, although to clarify, it's more "into" anthropomorphic stuff vs. being a fully fledged furry. Again, it comes down to how you define furry, if you place it at the lowest point (someone who likes stuff that's anthropomorphic) then everyone whose interests lie beyond that is a furry, but if you place it at the other extremity (the stereotypical view of furries), then there's a middle ground that's undefined. I'm pretty sure by the "normal" definition that would make you a furry. Yeah, but that's if you use that definition. There are a lot of people who would use the other definition, in which case I'm in the undefined middle ground, thus "into" furry but not furry. I do identify myself as a furry now, I'm just sure to always follow it up with my definition. If only the word weren't so weighted, this would be a lot easier. I know, right? I was on PokeFarm a little while ago and my older sister walked in to ask me something. She saw the screen and asked if it was "one of my furry websites". Not only was it completely out of the blue (the only furry stuff she's seen me with were my Housepets! books) but the inflection in her voice was the kind you have when you want to make a joke but you don't want to hit a possible sore spot or come off as mocking or disapproving. That subtle tone told me that she might think I'm a full furry and wouldn't particularly approve if so, but she understands it's my choice and doesn't want to poke at it in case it's either not as bad as she thinks or it's a sensitive topic for me. Needless to say, social stereotypes have more of an impact on how we treat each other than we think and furries (all kinds) get some of the worst assumptions heaped on them of any other minority (that's not to discredit any other minority out there ). My mom still doesn't like me hanging out with "those furry people." Which is why I get frustrated every time she asks me who I'll be hanging out with when I say I'm going somewhere with friends. I'm not sure if all of my friends beyond my two closest are even aware of the furry fandom. I should ask them and see.